Want to try something new in Los Angeles? If you are looking for something exciting to try out, then our gourmet sausage pub restaurant, Link N Hops, could be the ideal solution. We have a wide range of sausages on our menu, with unexpected ingredients including wild boar and duck, and even vegan options. Whatever you want to try for the first time, you should come and sample our gourmet Bratwurst restaurant in Los Angeles. We also offer a number of craft beers, so you can eat sausages the right way, with a traditional brew beer in your other hand. The key to enjoying life in Los Angeles is to keep trying the unique experiences that the location has to offer. You might have sampled some of the brand-new Japanese menus out there, or even gone to a real Mexican restaurant, but if you want something really new and exciting then our sausage eatery menu can’t be beat. Whatever you are looking for, from international craft beers to spicy jalapeno toppings, can be found at our two eatery locations in the Los Angeles area. We are so confident that you will continue to enjoy our sausages and beers that we now run to separate eateries, one in Atwater Village and the other in Sunland-Tujunga. We also try to keep up with the community spirit by hosting events, particularly our trivia nights at 8 PM, on different days in our two different locations. If you wanted to, you could sit the trivia event in one place, and then travel the next day to trivia in the next location. All while drinking beer and enjoying some delicious select sausages from our range. For something completely different, try our range tonight. Link N Hops is most proud of our unique sausage and beer eateries, and we are proud to share our love of both of these findings with our fellow residents of Los Angeles. 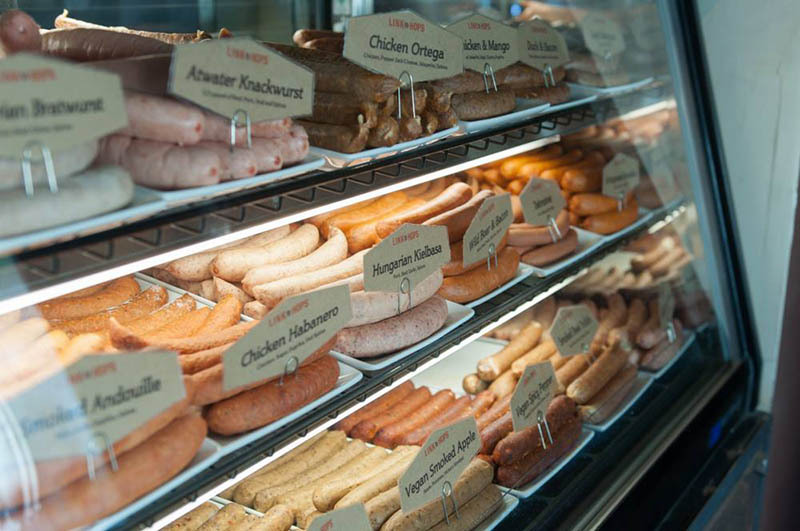 Whenever you are in the area, come on down to our Bratwurst restaurant in Los Angeles, and sample our latest sausage ranges. If you are planning your trip ahead, then you can call us, on (323) 426-9049 (Atwater Village) or (818) 293-3316 (Sunland-Tujunga). You can also reach out to ask this question by using our online form today, and we will be happy to answer any questions you may have.